“One more thing” is the closest thing I have to a theme for this round of #30daysofbiking. There’s just always so much I want to share about biking and it’s been a convenient way to tuck something unrelated at the end of each post. I’m making my “one more thing” the first thing on this last of the 30 days. 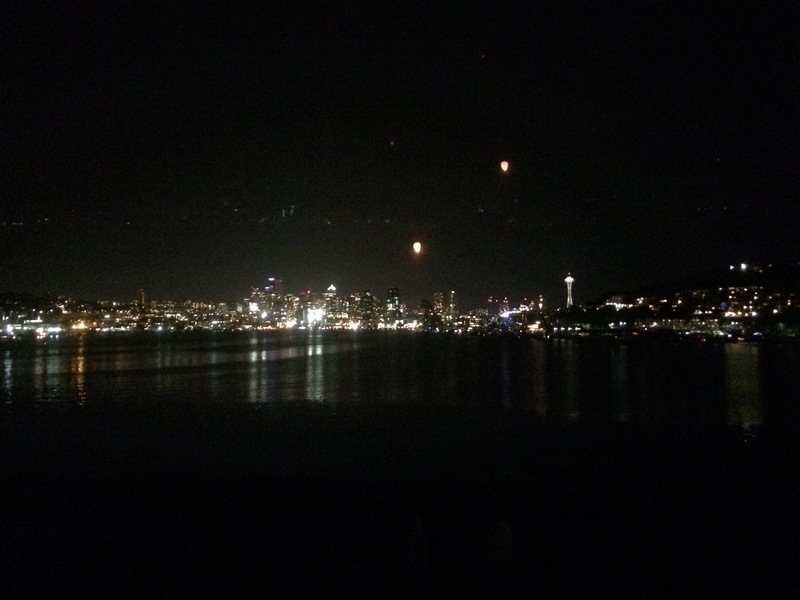 Tonight’s “one more thing” was an 11pm impromptu ride with Pixie up Kite Hill in Gas Works Park. It was a beautifully clear day in Seattle, the kind where I gasp and stop pedaling when I first catch sight of Mount Rainier. It was also a beautifully clear night. I pedaled past a fire twirler in the flat part of the park and arrived up the hill just as a paper lantern was being released. I don’t often bike just for the sake of biking (and I brought my wallet along in case I felt compelled to hit a grocery store on the way home and turn my ride into an errand), but I adore the silly-ride component to 30 Days of Biking and consider a 11:59 p.m. pajama-clad circle in the living room just as important as any other ride. So I’m happy to end my month with a ride with no purpose other than getting out on my bike. I sat on the hill with my little dog shivering in my lap and watched as two more lanterns journeyed up and over the Space Needle. I had a lot of company on the hill. I was kind of surprised, but I guess 11pm on a Saturday night isn’t all that late for most people. 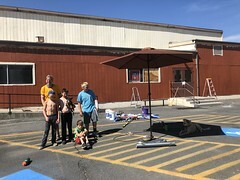 I was surrounded by conversations: two people arguing about work stuff, a small group practicing some sort of dance behind me, three college-aged kids with a camera speaking in Japanese, and more. It didn’t take long for me to realize I was the only buddy-less person in the park (sorry, Pixie, you don’t really count). I stayed a while longer, enjoying the view and surrounding chatter, but eventually bundled Pixie back into the bike basket and headed down the hill, thoughts of aloneness filling my head. I spend a lot of time alone these days. Maybe not a lot of time, but every other weekend without the kids still feels like a lot. It’s great having the luxury to easily travel to Portland and other places kid-free, but at the same time, all that travel is in large part about keeping busy. I’m just not very good at being alone and get stir crazy. If I sound pitiful, please know it’s not that bad! I had to check just how long ago I shared I’d been called profoundly sad–this past December, on the Big Dummy’s birthday. Not even five months later I no longer feel that way. Yay me! I wouldn’t say I’m back to normal yet, but I’m a helluvalot more used to my new normal. And still: biking makes everything so so so so so much better. The simple act of biking is so joyful. Just as a bike makes it easier to escape an unpleasant situation, such as my one more thing on the 18th, it also makes it easy to escape a bad mood. It’s really hard to stay in a grumpy mood while biking, and I’m a bit of a wallower so sometimes I try to stay grumpy in vain. And then there’s the community of the biking public that continually lift my spirits. There are days I’ve had trouble shaking a bad mood, but I’m able to have a string of pleasant biking interactions that fix everything. Often it’s bumping into a friend and either stopping to chat for a few minutes if we’re traveling in opposite directions or sharing a few minutes of our separate-though-momentarily-parallel rides. And sometimes it’s just having a favorable interaction with a stranger, like the helmetless guy on a brakeless fixie while his normal bike was in for repairs who was happy to follow my kid-friendly route through South Lake Union on Thursday or a nice “Hey we have the same helmet” conversation at a red light on Friday. Not to mention the wonderful people I meet through bicycling. I’d imagine it’s not the only way to meet cool people, but I sure don’t know any other way. Today at my Urban Cycling book reading at the Burien Library I got to meet Meredith, a fellow family biker, in person for the first time…though I feel like I already knew her thanks to social media interactions. And yesterday was the same, though way different with Stevil Kinevil of All Hail the Black Market, my friend I hadn’t actually met in person before. He’s no family biker, but we still talked about all the pertinent stuff: bikes, art, homebirth, kittens. Me! I’m that dude on the bike! Alone, but not really. Just because April is now over doesn’t mean I’m quite done covering our month of bikey exploits. We has the most amazing time in Minneapolis over Spring Break. Visiting the birthplace of 30 Days of Biking during 30 Days of Biking was such a treat. And I intend to tell you all about it. I meant to do so today, but I’m just not organized enough. I hope to take advantage of the #TBT (throw-back Thursday) trick and get it written on Thursday when I can pretend it was my intention to post in May all along. Oh, I always enjoy reading your posts, and you’ve inspired me. I haven’t been doing a lot of biking since I was pregnant with hip issues, and your post was a reminder that even getting out for a few laps around the block would do wonders for me. I am glad that you are feeling more settled. When my oldest did some camping trips with my husband last fall, it felt like a combination of yay, I just need to care for a newborn, and oh, I miss him so much!! In observing other families, I think that alone time becomes less lonely, if you know what I mean?